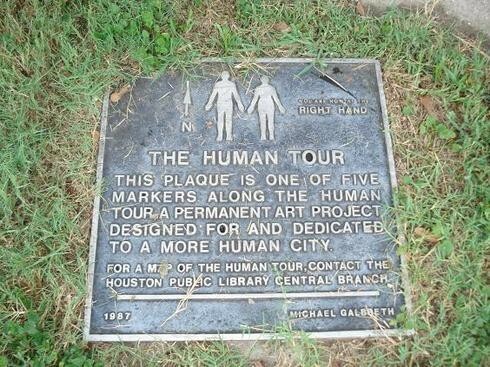 Back in 1987, Michael Galbreth (half of the Art Guys) co-created a human-shaped overlay on the City of Houston. He put down plaques where the hands, feet and head would be. All that remains is the right hand, which John Nova Lomax of the Houston Press recently rediscovered. Here is how this project worked. Would-be Human Tourists could go to the library or DiverseWorks's old HQ on Travis near the bayou and pick up a map which included a description and history of the project, detailed instructions on the scavenger hunt-like tour, and histories of the old Houston neighborhoods through which it passed. 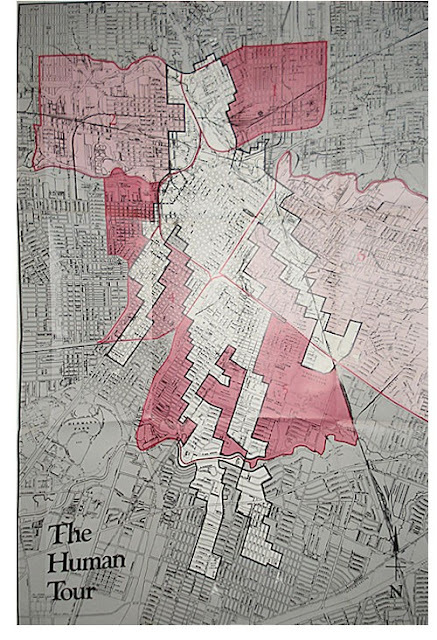 "The tour is designed for people to see areas of the city with which they may not be familiar and get some sense of the neighborhoods," Galbreth said at the time, and indeed, back in 1987, there were vast areas of the Inner Loop that were Terra Incognita to polite West Side society. The Human Tour passed through most of them, including Second, Third and Fourth Ward and the Near North Side. While there are still a lot of Houstonians who have never been through some of those areas, the number is a lot smaller now that the Inner Loop has gotten so gentrified. Galbreth reiterated to the Chron that his work was to be a permanent project. But this is Houston; nothing is permanent. He tells HairBalls that the plaque on Wichita Street and Austin in the Binz is the sole surviving relic of the Human Tour. It would have been great (if perhaps overly ambitious) to paint all the streets and building roofs bounded by that area white, so that the figure would be visible from space. A year ago we moved close to this plaque. I discovered it while walking the dogs. I'm disappointed to learn it is the last remaining plaque.